Refrigeration gauge is mainly made up of iron and copper. Usually, the color of the case is either red or blue. 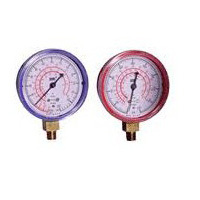 The refrigerant pressure gauge, also known as freon pressure gauge is used for measuring refrigeration system or all kinds of frozen system pressure measurement, such as air-conditioning, cold storage refrigeration system, industrial chillers, cold coal filling equipment, as well as central air-conditioning. The refrigerant pressure gauge (freon pressure gauge) is the same as the general pressure gauge's structure, but the difference is that it is stricter in the process the request, also it is more stringent in air tightness requirements. So in the welding and leakage and other links are using special welding and testing methods, in order to ensure that the refrigerant leakage. The company's production of refrigerant pressure gauge is usually used for measuring 22, 134, 12, 407, 407, 410 cold medium. Ma Anshan Exact Instrument Co., Ltd is a professional manufacturer of all kinds of refrigeration gauge instruments (freon pressure gauge ). Our company specialize in designing and manufacturing standard pressure gauges, thermometers, capsule gauges, differential pressure gauges, electrical contact gauge, process pressure gauge, absolute pressure gauge, and so on. Our freon pressure gauges are widely used in oil, chemical industry, metallurgy, electricity, manufacture, papermaking, food, energy, etc. Our products have been exported to U.S.A, Canada, Europe, Spain, Egypt and South-east Asia, mid-east and so on. Air Test GaugeAir test gauge is also called gas test pressure gauge. Its case is mainly made of black steel. Its restrictor reaches the standard for all range. Air test gauge is used to measure the pressure of coal gas.